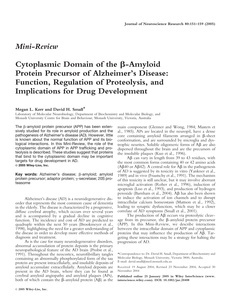 The â-amyloid protein precursor (APP) has been extensively studied for its role in amyloid production and the pathogenesis of Alzheimer's disease (AD). However, little is known about the normal function of APP and its biological interactions. In this Mini-Review, the role of the cytoplasmic domain of APP in APP trafficking and proteolysis is described. These studies suggest that proteins that bind to the cytoplasmic domain may be important targets for drug development in AD.